Quest AT's 3 disc Starter Set gives you a great set of discs to not only learn with, but is also great for players of all skill levels. We chose these discs because they are the ideal first 3 discs to start with. The Driver and Midrange utilize Dimple Technology to help discs fly straighter and further than their non-dimpled counterparts. 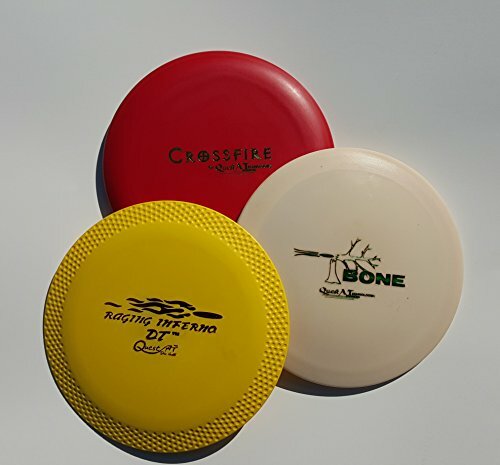 Discs included are Raging Inferno DDT (Driver) T-Bone (Midrange) and Crossfire (Putter). Ultra-Lights are better discs than heavier ones for most players, as they are easier to throw further, and don't require the same power/snap to go as far. *Colors and plastic type may vary* Quest AT discs are made in the USA. PDGA Approved. ALSO CHECK OUT our 6 piece Cross Fire Party Pack, 30 piece x-out set,25 piece set 18 Piece Multi Starter Sets (6 3pc starter sets), and 5 Piece Set. All available on Amazon. Set features Discs with Golf Ball Dimples which make Discs fly further and straighter. CHECK OUT OUR OTHER SETS: Quest AT 5 Piece Set, Quest AT 3 Piece DRIVERS Set, and Quest AT 5 Piece PUTTERS Set. Quest AT 30 Piece Disc Golf Blem Set. Manufacturer: Quest AT, Quest Applied Technologies, Inc. Publisher: Quest AT, Quest Applied Technologies, Inc. Studio: Quest AT, Quest Applied Technologies, Inc. Brand: Quest AT, Quest Applied Technologies, Inc. If you have any questions about this product by Quest AT, Quest Applied Technologies, Inc., contact us by completing and submitting the form below. If you are looking for a specif part number, please include it with your message.